Congratulations to Karen Rowett on being awarded a CVI Life Membership. Karen has been involved in calisthenics in Victoria over the past 30 years and has dedicated many hours volunteering her time. 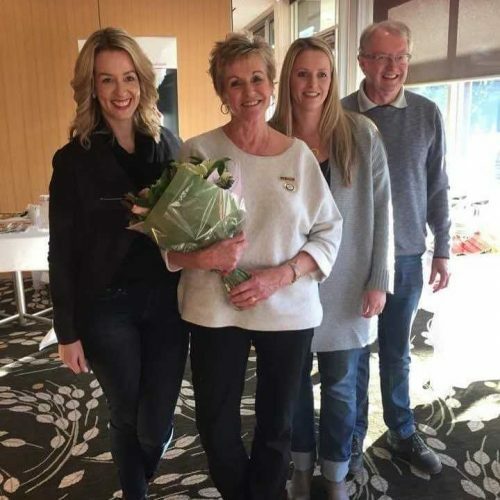 She has been active within the Ceres Calisthenic Club when her two daughters, Lauren and Jackie, were competing and then as an Old Collegian, organising, attending and supporting social activites. Karen attends many of the competitions across all sections throughout the year, particularly the Masters now Lauren competes in the Masters team. Karen has also generously catered for and entertained VIP guests at the Ceres Annual Concert for many years. Karen has volunteered at CVI during this time in the office helping out, timing at competitions, writing for adjudicators, catering for adjudicators at competitions, chaperoning State Team girls, Managing Uniform requirements for State Team and offering support whenever and wherever it is required. Congratulations Karen on your CVI Life Membership. You are truly a deserving recipient.